Manny Pacquiao defeats Timothy Bradley via Unanimous decision in their bout Today, April 16, 2016 at MGM Grand Las Vegas, USA. Pacquiao dominated in the rounds, he is more stronger and more faster than the younger opponent. Pacquiao also scores two knockdowns first in the 7th and 2nd in the 9th round. Bradley's really behind by the points thru the 10th round and he is not a KO boxer so it was hard for him to capitalized. 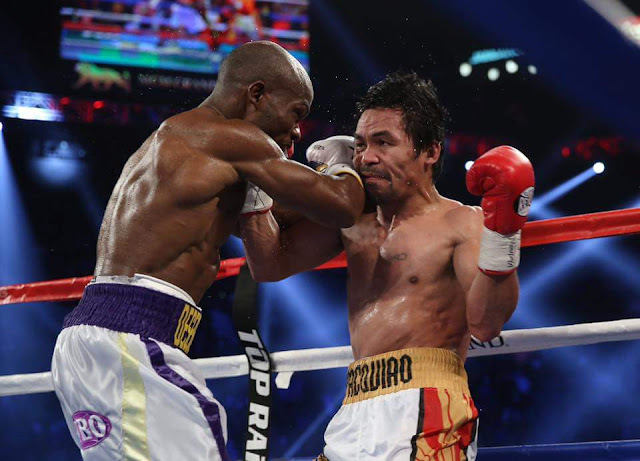 The frustrated boxer Bradley won the last 2 rounds but still defeated by the older Filipino Manny Pacquiao. Pacquiao deserves to win this fight. It was a decisive match and Pacquiao proves to be the dominant fighter. Pacquiao ends his career with the record of 58 wins including 38 victories coming by way of KO and 6 losses while Bradley dropped his record to 33W(12KO)-2L. Pacquiao estimated earned with 7 million dollars and Bradley with 3 million dollars.